Whenever you buy medicines or vitamins at Mercury Drug, they always ask for your Suki Card. If you say I don’t have, they do not inform you how to get one unless you ask for it. So if you always buy medicines or vitamins, it is better to get your own Suki Card. Why? 1. It is FREE. Yes, you don’t have to pay for the membership card. 2. You get instant savings or surprises in all Mercury Drug Stores where Suki Card program is available. I had my first Mercury Drug Suki Card when I was still in college, I was diagnosed with psoriasis so every month I always buy medicine. Sayang ang points so I asked the staff on how I can avail one. Getting Suki Card is so easy and you can claim your card immediately. But on my first application, for approval pa daw so I have to return to the store to claim my card. 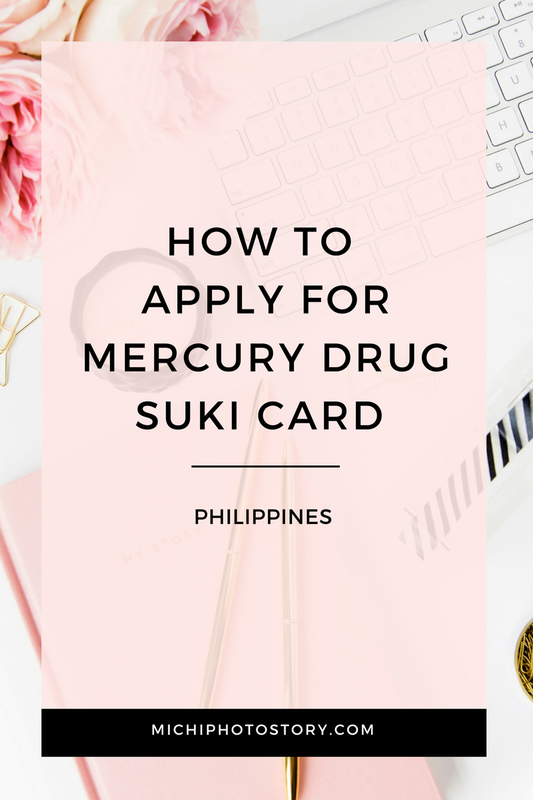 I think it’s been more than a year already since I haven’t used my Mercury Drug Suki card because we could not find it. My husband is the one who always buys my medicine and he can’t remember where he placed my Suki Card so I gave up na. It is already a lost card. Sayang ang points. The Mercury Drug where we buy medicine has Drive- Thru so when we bought medicine, I told the staff that I want to apply for Mercury Drug Suki Card, but he said, I need to go inside the store to apply. There is no parking slot at that time so I did not apply. Last month, we went back to Mercury Drug to buy my medicine and I told my husband to park the car because I will go inside. So I bought my medicine and after that, I informed the staff that I want to apply for Suki Card. He just asked me to fill out the form, gave my card, encoded my information, and stamped my receipt. Normally, they also get your receipt but I told him that I need my receipt. 1. Customers must be 18 years old. 2. He or she must present single or accumulated purchases worth P1000 made in any Mercury Drug Stores with no time limit from August 2000. I did not know that I can replace my lost Suki Card, I just learned it when I was reading the Suki Card Program Guidelines. Anyway, expired points na rin naman yun so no use na. 1. Benefits of members will be discounts on participating products and all purchases made through the card will earn points. Every purchase of P200 worth is equivalent to 1 point. 2. Mercury Drug Suki earned points is redeemable up to the last point starting at one point in any Mercury Drug Suki Program is available. 3. There will be a replacement fee of P50 for damaged or lost card, and earned points from damaged/lost card will be transferred to the new Suki Card. 4. Purchase of Senior Citizen Suki Card members with 20% discount are not entitled to Suki discount and points. 5. Unredeemed points will be reverted to ZERO if the Suki card is not continuously used for 180 days (6 months). 6. Always present your Suki Card before making any purchase. No Suki Card, No points, No Suki Priviledges. 7. Mercury Drug reserves the right to modify or restrict the usage of card without prior notice. How I wish I applied sooner because I was not able to get the Mercury Suki Day Planner. Ang ganda ng planner nila ngayon and marami pa choices. Malayo sa first Suki Day Book ko last 2013. I have Mercury Suki Card already i availed this because i always buy a medicines for my father. All your said here is true sayang nga lang din po at hindi ko na siya masyadong nagagamit ngaun. Waaah i want the planner too but i don't know if my points here is puede pa.
Naeexpire na kasi Suki points, unlike dati wala naman expiration. Feeling ko wala na nga planner, nagkaubusan. I just bought medicine yesterday e.
I also have my first Mercury card when I was still in college because I use to buy my lola's meds. Now, I lost it and didn't reapplied. However, I have a Mercury planner now. I tried purchasing it for P200 but the guard at the branch let me used his card because he still has more points. He just told me to buy three pantyliners so that his card will earn some pts too. I get the free planner and also got the items. Thanks o he guard who willingly let me used his. Wow, ang bait naman ng guard, win-win situation. Kahit saan branch po ba galing ung receipts? Like for example mercury drug baliwag then mercury drug vaenzuela branch? Is it okay? . Sa lahat ng loyalty cards, ito ang pinakapaborito ko!